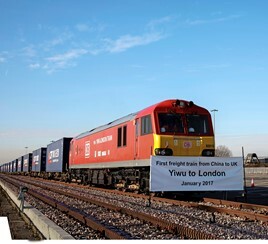 China wants to increase the number of freight trains carrying goods between China and the UK, to help improve trading relations between the two countries. Speaking exclusively to RAIL, Ma Hui, Minister of the Embassy of the People’s Republic of China in the UK, said freight trains offer a viable option for moving goods between Europe and China. “The idea is very much there to expand the number of freight trains as it sits between air freight and sea freight - it saves time and it saves costs, so it offers more options in terms of doing business between China and the UK,” he told RAIL. At present, one train a week runs between London and Yiwu, via Duisburg in Germany. RAIL understands it costs £4,500 to transport a 25-tonne container between the two countries by rail, compared with a cost of £1,900 to move it by sea and £23,000 by air. The rail service trumps the sea freight option, by taking approximately half as long as a large container ship to move cargo between the start and end points. To read the FULL exclusive story, read RAIL 858, published on August 1, and available digitally on Android/iPad from July 28.